SECAUCUS, NJ (September 2009)—Just in time for the holiday season, The Manischewitz Company announces the launch of the 4th Annual Man-O-Manischewitz Cook-Off, a cooking contest designed to encourage home cooks to challenge themselves in preparing a meal that is kosher, simple and delicious. The contest encourages home chefs to experiment with different ethnic foods and to think of preparing a Kosher inspired meal as part of that experience, in the same way people enjoy preparing Japanese, Italian, Mexican, Chinese and other popular ethnic cuisine. 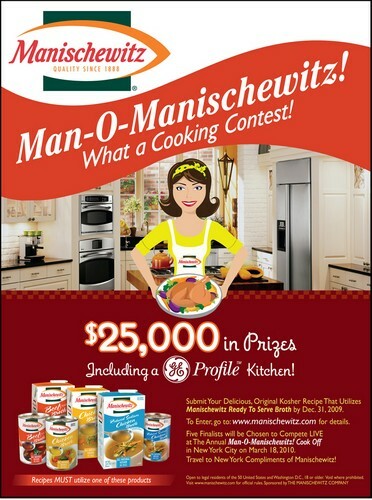 Entrants will compete for a chance to be crowned the “King or Queen of Kosher” and win the $25,000 grand prize package including GE Profile kitchen appliances, cash and more. Five finalists will win an all-expense paid trip to NYC to compete live on March 18th at the Jewish Community Center of Manhattan. The contestants will be judged by an on-site cooking panel consisting of food media and other culinary experts. This year the cook-off will be bigger and better than ever with legendary acclaimed chef, Jacques Pépin as the celebrity guest of honor who will act as MC, head judge and award prizes. Pépin is one ofAmerica’s best-known chefs, widelyrecognized as the host of eleven acclaimed public television cooking series and the author and publisher of twenty-six cookbooks. He is also a founder of The American Institute of Wine and Food (WIWF) and has been the Dean of Special Programs at the French Culinary Insitute (New York) since 1988. Chef Jacques Pepin has created some exciting recipes using the new Manischewitz Broth which will be available in the recipe section ofwww.manischewitz.com. Just-in-time for the Cook-Off, The Manischewitz Company has added a new line of ready-to-serve broths to its extensive portfolio of kosher products, giving you additional items to add to your creative recipe! New Manischewitz Broth starts with a recipe, not a formula, and is slow cooked in small batches. Filtered water is added to all natural ingredients and real kosher chicken and beef stock to deliver that homemade taste. Manischewitz Broth is packaged in a 14 ounce, easy open, pop-top can or a 32 ounce easy to pour reusable carton and is available in three flavors: Chicken, Reduced Sodium Chicken and Beef. Look for these wholesome broths inthe kosher and soup section of supermarkets nationwide.Suggested retail price for the can is $1.69 and $2.99 for the carton. As an added bonus, this year’s event will benefit Jewish American Heritage Month (JAHM), a national month of recognition of the more than 350-year history of Jewish contributions to American culture. Updates on JAHM will be available onwww.Manischewitz.com shortly and will continue through the end of JAHM on May 31, 2010. The Manischewitz Company is the official corporate sponsor of JAHM, and will work with the JAHM steering committee to drive awareness of events and programs. For more information, prize details, rules and regulations, log ontowww.manischewitz.com. For media inquiries please contact Helen Magg atHelen.Magg@bhgpr.com. 1. In a large stock pot sear chicken skin side down in olive oil; remove. 2. In same pot, sauté onions, celery and garlic. broth that comes to the surface; add water if necessary to keep chicken covered. 6. Remove chicken and set aside on serving platter. 7. Skim off any remaining fat or froth; add artichokes, tomatoes and basil; simmer briefly. Serving Suggestion: Strain 1 1/2 cups of stock and add to 1 1/2 cups of couscous for a quick side dish. In August 2004, the company changed its name from The B. Manischewitz Company, LLC to R.A.B. Food Group, LLC and today is now known as The Manischewitz Company. The Manischewitz Company is a specialty food company that includes the Manischewitz®, Season®, Guiltless Gourmet®, Asian Harvest®, Rokeach®, Mispacha®, Horowitz Margareten®, Jason®, Mother’s®, Carmel®, Croyden House®, Mrs. Adler’s® and Goodman’s® brands. The company offers a diversified line of premium kosher food products that covers over 60 different categories. The Manischewitz brand was founded in a small bakery built to make Passover matzo in 1888 by Rabbi Dov Behr Manischewitz in Cincinnati, Ohio. In 1932, Rabbi Manischewitz opened a plant in Jersey City, NJ, replacing the operation in Cincinnati. This move paved the way for the introduction of new products like Tam Tam Crackers, Chicken Soup, Noodles and Gefilte Fish. Today, all plant operations take place in Newark, NJ. Manischewitz continues to introduce unique, delicious, premium specialty food products such as coating crumbs, dairy-free frostings and more.